The Indian edition of the Wall Street Journal has just carried a nice chat with World Chess Champion Viswanathan Anand. Check it out to find out what he thinks about online chess, his forthcoming title match and more. World chess champion Viswanathan Anand joined his first chess club when he was six, at a time when the game was a niche hobby in India. It was his mother who first taught him how to play. Since then, Mr. Anand, a native of the southern Indian city of Chennai, went on to win the World Chess Championship five times, most recently last year. At the next edition of the tournament, to be held in November, Mr. Anand will be playing against Magnus Carlsen, a 22-year-old Norwegian. Mr. Carlsen on Monday won the Candidates’ Tournament in London to become Mr. Anand’s opponent at this year’s world championship. The location for the competition is yet to be decided, though there are rumors it may take place in India. In an interview with The Wall Street Journal, Mr. Anand, 43, spoke about his mother teaching him to play chess, how the game shapes the way he thinks, and about the pros and cons of online chess. The Wall Street Journal: Who taught you how to play chess?Viswanathan Anand: I started because I pestered my mother to teach me how to play. I saw my elder brother and sister playing so I went after my mother to teach me as well. She taught me the rules. They watched me dabble a little bit at home with it and then, I think, they began to see that maybe I was more interested than they had expected me to be. My sister then remembered that she had seen a chess club in the city called the ‘Mikhail Tal Chess Club.’ That’s how it got rolling. I was six when I learnt how to play, and about six months later I joined the chess club. WSJ: Why should anyone play chess?Anand: I would say give it a try and let’s see if you can carry yourself away from it. WSJ: What was it about chess that made you stick to the game?Anand: It was the idea of matching wits against an opponent. If you didn’t get your way, you went back home and you quickly read a chess book to find another trick you might use. At that age, it was very simply the thrill of outwitting someone. WSJ: How does playing chess influence the way you think?Anand: I think an important lesson from the game is that once you have made a move, you cannot take it back. You really have to measure your decisions. You think a lot. You evaluate your choices very carefully. There’s never any guarantee about what’s going to follow once you have made a decision. Once you take a decision, you know you can’t take it back and you have to live with its consequences. That trains you also to understand the very fact that decisions have consequences. And, I’ve found chess players to have a very structured way of thinking. That comes naturally to them. WSJ: When you first started playing, how popular was chess in India?It was very much a niche thing. I was very lucky that while I was a chess player in a country where chess was not a big deal, I happened to be in the one city where there was a sprouting chess team: Chennai. I remember that in the chess club I joined, people were reasonably passionate about the game. I used to visit the club on Mondays and Thursdays in the evening and on second Saturdays and Sundays. At one point I remember spending most of my Sundays in the chess club. But it was very far from being a mainstream sport at that time. Though chess had its origins in India, it had very clearly moved away from that. When I was growing up, as I showed an interest in the game, my parents would say: get a real job. WSJ: And today? Do you think chess in India is now a mainstream hobby?Anand: After I became a grandmaster [in 1987], I went to a school tournament as a chief guest. When I used to play at these tournaments, there used to be maybe 30-40 participants. But during my visit to this school [in the early 1990s] I noticed that the numbers of players were more than a thousand. In fact, the organizers had to turn away some of the games to a venue outside the school because they could not accommodate all of them. Suddenly, chess had become visible. There was an increase number of chess academies that had opened across the country. Even anecdotally, number of parents who began enrolling their children in chess coaching camps during the summer was rising. I saw that change right in front of my eyes: suddenly, parents started encouraging their children to play chess. The knowledge and awareness about the game was definitely increasing. That said, chess still had a kind of geographical niche. It is more prevalent in big cities and in southern states. WSJ: How do you prepare before a major competition?Anand: I go to the gym every day. That tends to taper off when I’m at a tournament. During tournaments, I’m not trying to build fitness. I’m simply trying to keep away any kind of tension. I go for long walks to clear my head. Before a game I avoid having a heavy meal so that I don’t feel sleepy at the board. You eat to be healthy and that generally takes care of everything. Also, you can’t be too finicky since at tournaments you tend to eat at restaurants here and there. But, as long as you’re eating sensibly, it’s all good. WSJ: Is the future of chess online only?Anand: I find that it’s an exaggeration to say that everything will move online. I don’t think things will move that fast. And personally, I find the need to look and think with a chess board. It’s true that one does end up doing a lot of work online since it is driven by convenience. But it’s better to work with a chess board because in a way, you are acclimatizing yourself to the atmosphere in which you need to compete. It’s very important not to lose that balance. Chess benefits a lot from being online; it allows a lot of people to follow a game live. So yes, the Internet has helped the game to find a larger audience. WSJ: Who is the chess player you most admire? And the one you most fear?Anand: My favorite player growing up was Mikhail Tal. The most intimidating? I think there have been difficult opponents at different moments. It’s very hard to pin point one. 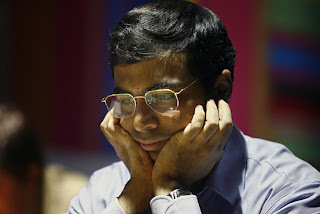 WSJ: Do you think it’s time for the game to enter the Olympics?Anand: I would love for that to happen. The thing is that it’s a very long winded process with the International Olympic Committee. The wheels turn very slowly. Besides making a public case for chess to be a part of the Olympic Games, there’s not much that can be done to drive it. WSJ: Where is the best place to play chess in India?Anand: I’ve enjoyed playing in many Indian cities. I think, in general, for a sportsperson, Kolkata is a good place to be. The city, I feel, tends to take its passion for sport very seriously. Norway Chess Talent: It's 13-year-old Aryan Tari! Fide Chess Candidates 2013 Photo Trivia Quiz!